First, let’s determine your eligibility to file Form I-765. These questions will help confirm that you may receive employment authorization (work permit). You currently have an EAD, but you are now applying under a new category. For example, John already has an EAD because he is an F-1 student with OPT. Recently he married a U.S. citizen and is in the process of adjusting status. John can now apply for an initial EAD as an adjustment of status applicant. It’s an initial application because his category changed from F-1 student to adjustment applicant. You were issued an EAD, but it was damaged, destroyed or mutilated. For example, Maria is a DACA recipient with an EAD. Somebody recently broke into her car and stole her belongings. She must replace the card so that she has proof of status. You were issued an EAD that is expired/expiring and need to renew it under the same category. For example, Edward is the spouse of an L-1 intracompany transferee and has an EAD because of this status. However, it will expire in approximately 120 days, so he must renew it now. When does your Employment Authorization Document (work permit) expire? Sorry, you cannot file for a renewal EAD more than 120 days before your original EAD expires. You may complete the form now. However, do not mail your application until 120 days before the card expires. You must be at least 15 years of age to prepare this application and receive employment authorization. To determine if you are eligible to file an Application for Employment Authorization, USCIS wants you to identify the category you belong to. Your eligibility category also affects your filing instructions. If you already have an Employment Authorization Card (work permit), you can find your eligibility category on the front of your card. Look for the “Category” on the front of your card. In the example below, the category is “C09”. Find your category and select that code from the drop down list provided. U-1 Nonimmigrants: If you are currently residing in the United States and your Form I-918, Petition for U Nonimmigrant Status, is approved, you will receive employment authorization incident to status and USCIS will send you an EAD as evidence of that authorization. You do not need to file Form I-765. If you resided outside the United States when your Form I-918 was approved, you must file Form I-765 with USCIS when you enter the United States. Please select a valid eligibility category above! A K-1 or K-2 visa holder cannot renew an EAD (work permit). Instead, you must submit an Adjustment of Status Application and base your new EAD application under the Adjustment of Status applicant (c)(9) category. If you are filing for initial or extension of Family Unity benefits, complete and submit Form I-817, Application for Family Unity Benefits. An EAD (work permit) will be issued if your Form I-817 is approved; you do not need to submit Form I-765. Family Unity beneficiaries should only file I-765 to replace a non-expired EAD card that is lost, stolen or damaged. If you are filing for initial or extension employment authorization under Family Unity provisions of section 1504 of the LIFE Act Amendments, you should not use this form. Instead, complete and submit Form I-817, Application for Family Unity Benefits. An EAD (work permit) will be issued if your Form I-817 is approved; you do not need to submit Form I-765. LIFE Family Unity beneficiaries should only file I-765 to replace a non-expired EAD card that is lost, stolen or damaged. You may only request a renewal of your EAD with this eligibility category. If you wish to apply for a renewal EAD as a National Interest Waiver Physician, please go to the intial question on this page and change it to "renewal." If you are filing an initial application for Consideration of Deferred Action for Childhood Arrivals, we encourage you to consult with an immigration attorney. If you are filing a renewal application for Consideration of Deferred Action for Childhood Arrivals (DACA), we encourage you to use our DACA Application. This includes the Form I-765 and Form I-821D. If you are filing an initial application for Temporary Protected Status, we encourage you to use our TPS Application. This includes the Form I-765 and Form I-765, Application for Temporary Protected Status. Sorry. You cannot continue. Although this is a valid eligibility category, CitizenPath does support the category at this time. Due to the complexities of obtaining employment authorization for this category, we recommend that you use an experienced immigration attorney. Are you filing Form I-485 on the basis of asylum or refugee status? If you were admitted as a refugee or granted asylum and are now filing Form I-485 to adjust status to permanent resident on that basis, do not file Form I-765 under eligibility category (c)(9) as an adjustment of status applicant. If you are an asylee and have applied under INA section 209 to adjust to lawful permanent resident status using Form I-485, file Form I-765 under category (a)(5) as an asylee. Do not file Form I-765 under eligibility category (c)(9) as an INA section 245 adjustment applicant. If you were admitted as a refugee and have applied under the Immigration and Nationality Act (INA) section 209 to adjust to lawful permanent resident status using Form I-485, Application to Register Permanent Residence or Adjust Status, file Form I-765 under category (a)(3) as a refugee. Do not file Form I-765 under eligibility category (c)(9) as an INA section 245 adjustment applicant. Are you an A-3 or G-5 nonimmigrant who has filed a pending civil action against your employer because your employer violated the terms of your employment contract? Have you EVER been arrested or charged with any misdemeanor or felony crime in the United States? Certain criminal offenses (some misdemeanor crimes and most felony crimes) can affect the success of your application. Even if you have been arrested for a DUI (driving under the influence) or minor crime, you should truthfully answer this question. Your answer to this question suggests that you have a history which may require the assistance of a legal professional. We want the best result for you, and therefore CitizenPath suggests that you consult with an experienced immigration attorney that can provide you with additional guidance and representation. Have you EVER given false or misleading information to any U.S. government official while applying for any immigration benefit or to prevent deportation, exclusion, or removal? Congratulations, you're likely eligible to apply for employment authorization. Let's get started with some information about you, the applicant. Your legal name is your current legal name. It’s generally the name on your birth certificate or passport unless it has been changed by a legal action such as a marriage or court order. Spell out middle names completely and do not use just the initial. If you do not have a middle name, you may leave this field blank. Your other names include any other names that you have used in the past. Usually this includes maiden names or a name that you used before a legal name change. However, it includes any name (including nick names) that you have used in various legal documents, bank accounts, ID cards (e.g. driver’s license, work permit), criminal records, and school records. If you have been publicly known by another name, you should include it here. Have you used any other names since birth? Enter your place of birth and date of birth. Single Married Divorced Widowed Select the marital status you have on the date you are filing this application. If you are currently unmarried, but had a prior marriage that was annulled or otherwise legally terminated, select "Divorced." USCIS will process your application in the USCIS online filing system. The USCIS online account number is not the same as an A-Number. If you were issued a USCIS online account number, enter it in the space provided. If you do not have an account number (or do not know), you may leave it empty. If you choose not to access your USCIS online account, USCIS will still process your application in the USCIS online filing system. You will also receive notifications and updates about your application by mail through the U.S. Postal Service. Also known as an A-Number or USCIS#, your Alien Registration Number is an 8- or 9-digit number that can be found on your Employment Authorization Document (work permit) if you have one. In the example below, the A-Number is listed as “000-000-773” next to USCIS#. If your card is lost or missing, you may be able to find your A-Number on other documents. Only list a valid A-Number that was issued to you. Has the Social Security Administration (SSA) ever officially issued a Social Security card to you? 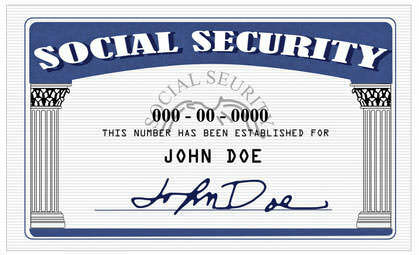 Do you want the SSA to issue you a Social Security card? If your request for employment authorization is approved, the SSA may assign you an SSN and issue you a Social Security card. Do you want the SSA to issue you a replacement Social Security card? 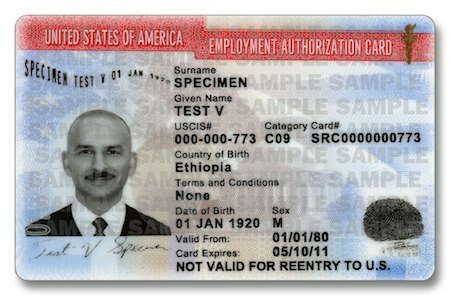 If your request for employment authorization is approved, the SSA can issue a replacement Social Security card. 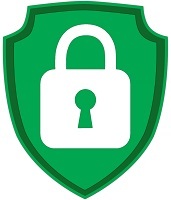 Do you authorize the disclosure of information from this application to the SSA as required for the purpose of assigning you an SSN (if necessary) and issuing you a Social Security card? If you do not consent to the disclosure of your information to SSA, you must go back and answer "No" to the question above. Enter your father's birth name. Applicants who do not know may enter "Unknown" for both names. Enter your mother's birth name. Applicants who do not know may enter "Unknown" for both names. If you have a social security number, you can find it on your social security card. Some other places that you can find your SSN are on tax returns, pay statements, and bank statements. However if you do not have a social security number, leave this field blank. Using a false SSN will result in your application being rejected. Tell us about your immigration history. List all countries where you are currently a citizen or national. If you are a citizen or national of more than one country, click the "Add Another Country" button to add another record. If you are stateless, select the name of the country where you were last a citizen or national. Are you eligible for benefits under the ABC settlement agreement? The American Baptist Churches v. Thornburgh (ABC) Settlement Agreement was a class action settlement between a class of Guatemalan and Salvadoran nationals and the U.S. government rendered in American Baptist Churches v. Thornburgh, 760 F. Supp. 796 (N.D. Cal. 1991) on January 31, 1991. The applicant must have applied for asylum by the required date. A class member who meets these three requirements may nonetheless be ineligible for benefits if he or she has been convicted of an aggravated felony or was apprehended at the time of entry after December 19, 1990. Enter your passport (or travel document) details below from your most recent entry to the United States. On your most recent entry to the United States, did you have a passport or travel document? Enter the expiration date for your passport or travel document, even if it has already expired. You most likely have an I-94 Arrival/Departure Record if you entered the U.S. lawfully. The information to answer the next few questions can be found in the I-94 record from your most recent arrival to the United States. If you do not have Form I-94, please refer to your passport. An I-94 is the Arrival/Departure Record issued by U.S. Customs and Border Protection (CBP) when foreign nationals enter the United States with a non-immigrant visa or some other status. The I-94 record confirms that the immigrant is legally entering the United States in a specific status and period of time. Modern I-94 Arrival/Departure Records are available electronically if the foreigner traveled by air or sea. 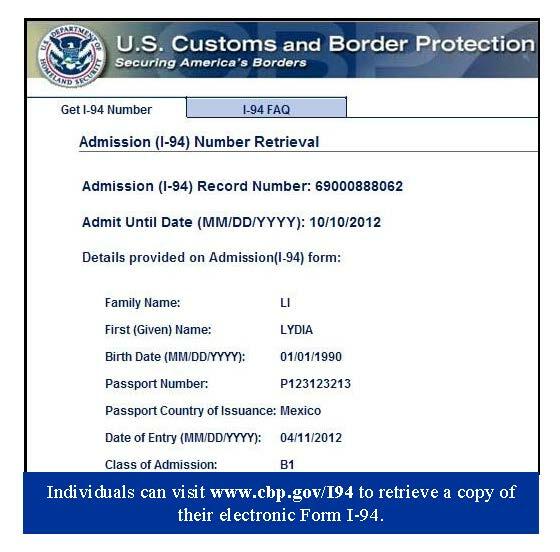 An electronic I-94 can be obtained by going to the CBP I-94 Website. If you are unable to find an electronic I-94, check your passport for a stamp. In some cases, CBP may provide an I-94 stamp instead. CBP still issues a paper I-94 at land border ports of entry. Also, if the foreigner arrived to the United States via air or sea before May 2013, CBP probably issued a paper I-94. The I-94 is a paper card like the sample below. The I-94 number (also labeled as a departure number) is an 11-digit number generally found in the upper/left corner. If your most recent entry was done with an advance parole document (common for asylees, DACA, TPS and some other statuses), your I-94 may be stamped or attached to the advance parole document. Canadian visitors may not receive an I-94 at land border crossings. This is a lawful entry as long as the visitor had a valid visa or parole (including the Visa Waiver Program) at the time of entry. If you are having trouble retrieving an I-94 from the CBP website, visit our knowledge base article on How to Find an Electronic I-94 Record for additional tips. You can find the following items on an electronic or paper I-94 record. A sample electronic I-94 record is pictured below. 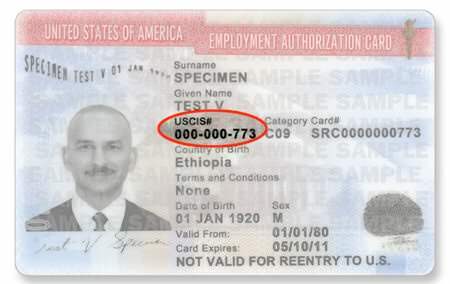 The Admission (I-94) Record Number is a unique 11-digit number that is assigned to each specific entry into the United States. This is the date of entry when the visitor arrived in the United States. The Admit Until Date is the date the visitor is authorized to stay in the United States. For students, the date may be labeled “D/S” for Duration of Status. This is the immigration status that was used for entering the United States. DACA Applicants: If you "entered without inspection," you probably do not have an I-94 Arrival/Departure Record or stamped passport. That's okay. You may skip to the next question. Enter the I-94 number from your Arrival/Departure Record (I-94). If you do not have an I-94 record, leave this field empty. Select the visa category you held when you most recently entered the U.S. and were admitted by a U.S. Customs and Border Protection (CBP) officer. The visa category will be listed on your I-94 record or visa which is located inside your passport. If you do not remember your visa category, please select "Other," and enter the written word for a broad category such as Visitor or Student. If an individual most recently "entered without inspection," the immigration status at last entry was No Status. If an individual entered with a valid visa that later expired, enter the visa type that was used during the last entry. In some rare cases, an individual may have been granted DACA and then re-entered the U.S. with advance parole. In this case, the immigration status at last entry was Deferred Action. If possible, refer to the Form I-765 in your initial DACA application. It's important to keep your answers consistent. If you did not keep a copy of your initial DACA application, contact the lawyer or organization that helped you. They should be willing to give you a copy. The date of last arrival is the date you most recently entered the U.S. which may be more recent than your I-94 record. Please select... Alabama, Birmingham Alabama, Huntsville Alabama, Mobile Alaska, Alcan Alaska, Anchorage Alaska, Anchorage - St Paul Airport Alaska, Dalton Cache Alaska, Fairbanks Alaska, Haines Alaska, Homer Alaska, Hyder Alaska, Juneau Alaska, Ketchikan Alaska, Kodiak Alaska, Nikiski Alaska, Pelican Alaska, Petersburg Alaska, Poker Creek Alaska, Sitka Alaska, Skagway Alaska, Valdez Alaska, Wrangell Arizona, Douglas Arizona, Lukeville Arizona, Mariposa Arizona, Naco Arizona, Nogales Arizona, Phoenix Arizona, San Luis Arizona, Sasabe Arizona, Tucson Arizona, Yuma Arizona, Yuma Intl Airport Arkansas, Fort Smith Arkansas, Little Rock Arkansas, Rogers Municipal Airport California, Alameda California, Andrade California, Bakersfield - Meadows Field Airport California, Calexico California, Capitan California, Carquinez Strait California, Chula Vista California, Crockett California, El Segundo California, Eureka California, Fresno California, Imperial California, Long Beach California, Los Angeles California, Los Angeles International Airport California, Los Angeles Seaport California, Monterey California, Morro Bay California, Oakland California, Ontario International Airport California, Otay Mesa California, Port Hueneme California, Port San Luis Harbor California, Richmond California, Riverside - March Inland Airport California, Sacramento California, Sacramento International Airport California, San Bernardino California, San Bernardino U.F. Airport California, San Diego California, San Diego Intl. Airport California, San Diego Sector Hq California, San Fernando Valley California, San Francisco California, San Francisco International Airport California, San Jose California, San Jose International Airport California, San Juaquin River California, San Luis Obispo California, San Pablo Bay California, San Pedro California, San Ysidro California, Selby California, Stockton California, Suisin Bay California, Tecate California, Travis Afb California, Ventura California, Westminster Colorado, Denver Colorado, Grand Junction Connecticut, Bridgeport Connecticut, Groton Connecticut, Hartford Connecticut, New Haven Connecticut, New London Delaware, Dover Delaware, Dover Afb Delaware, Wilmington District of Columbia, Washington Florida, Apalachicola Florida, Boca Grande Florida, Cape Canaveral Florida, Carrabelle Florida, Daytona Beach International Airport Florida, Fernandina Beach Florida, Fort Lauderdale Florida, Fort Myers Florida, Fort Pierce Florida, Hialeah Florida, Jacksonville Florida, Kendall Florida, Key West Florida, Leesburg Regional Airport Florida, Melbourne Airport Florida, Miami Florida, Miami International Airport Florida, Oakland Park Florida, Ocala Regional Airport Florida, Orlando Florida, Orlando Executive Airport Florida, Orlando Sanford Airport Florida, Panama City Florida, Pensacola Florida, Port Canaveral Florida, Port Everglades Florida, Port Manatee Florida, Port St. Joe Florida, Sarasota Bradenton Airport Florida, St Augustine Florida, St. Petersburg Florida, Tampa Florida, West Palm Beach Georgia, Atlanta Georgia, Brunswick Georgia, Savannah Guam, Agana Guam, Guam Int’l Airport Hawaii, Hilo Hawaii, Honolulu Hawaii, Honolulu Airport Hawaii, Kahului Hawaii, Kona Hawaii, Nawiliwili-Port Allen Idaho, Boise Idaho, Eastport Idaho, Porthill Illinois, Chicago Illinois, Chicago - O’Hare International Airport Illinois, Chicago Executive Airport Illinois, Decatur Airport Illinois, Midway International Airport Illinois, Milan - Davenport-Rock Island Illinois, Peoria Illinois, Rockford Airport Illinois, Waukegan Airport Indiana, East Chicago Indiana, Gary Indiana, Hammond Indiana, Indianapolis Iowa, Des Moines Kansas, Garden City Kansas, Wichita Kentucky, Louisville Louisiana, Baton Rouge Louisiana, Gramercy Louisiana, Lake Charles Louisiana, Morgan City Louisiana, New Orleans Louisiana, Oakdale Louisiana, Shreveport/Bossier City Maine, Bangor Maine, Bar Harbor Maine, Bath Maine, Belfast Maine, Bridgewater Maine, Buckport Maine, Calais Maine, Carbou Maine, Coburn Gore Maine, Eastport Maine, Fort Fairfield Maine, Fort Kent Maine, Hamlin Maine, Houlton Maine, Jackman Maine, Jonesport Maine, Limestone Maine, Lubec Maine, Madawaska Maine, Orient Maine, Portland Maine, Rockland Maine, Searsport Maine, South Brewer Maine, St Aurelie Maine, St Pampile Maine, Van Buren Maine, Vanceboro Maryland, Annapolis Maryland, Baltimore Maryland, Baltimore-Washington International Airport Maryland, Cambridge Maryland, Crisfield Maryland, Patuxent River Massachusetts, Boston Massachusetts, Fall River Massachusetts, Gloucester Massachusetts, Lawrence Massachusetts, Logan Airport Massachusetts, Manchester Airport Massachusetts, New Bedford Massachusetts, Plymouth Massachusetts, Provincetown Massachusetts, Salem Massachusetts, Springfield Massachusetts, Worcester Michigan, Algonac Michigan, Alpena Michigan, Battle Creek Michigan, Bay City Michigan, Detour Michigan, Detroit Michigan, Detroit Metropolitan Airport Michigan, Detroit-Bridge Michigan, Detroit-Tunnel Michigan, Escanaba Michigan, Ferrysburg Michigan, Grand Haven Michigan, Grand Rapids Michigan, Grosse Isle Michigan, Isle Royale Michigan, Lansing-Capital City Airport Michigan, Mackinac Isle Michigan, Marine City Michigan, Marquette Michigan, Marysville Michigan, Muskegon Michigan, Oakland County International Airport Michigan, Port Huron Michigan, Port of Battle Creek Michigan, Presque Isle Michigan, Roberts Landing Michigan, Rogers City Michigan, Saginaw/Bay City Michigan, Sault Ste. Marie Michigan, South Haven Michigan, St Clair Michigan, Willow Run Airport Minnesota, Baudette Minnesota, Crane Lake Minnesota, Duluth Minnesota, Ely Minnesota, Grand Portage Minnesota, International Falls Minnesota, Lancaster Minnesota, Minneapolis-St. Paul Minnesota, Noyes Minnesota, Pinecreek Minnesota, Rainer Minnesota, Rochester Minnesota, Roseau Minnesota, Silver Bay Minnesota, St Paul Minnesota, Warroad Mississippi, Greenville Mississippi, Gulfport Mississippi, Pascagoula Mississippi, Vicksburg Missouri, Kansas City Missouri, St Louis Montana, Billings Montana, Butte Montana, Chief Mt Montana, Cut Bank Montana, Del Bonita Montana, Glasgow Montana, Great Falls Montana, Great Falls International Airport Montana, Havre Montana, Helena Montana, Kalispell Montana, Morgan Montana, Opheim Montana, Piegan Montana, Raymond Montana, Roosville Montana, Scobey Montana, Sweetgrass Montana, Trial Creek Montana, Turner Montana, Whitetail Montana, Whitlash Montana, Wildhorse Montana, Willow Creek Nebraska, Omaha Nevada, Las Vegas Nevada, Reno New Hampshire, Lebanon Airport New Hampshire, Manchester New Hampshire, Pittsburgh New Hampshire, Portsmouth New Jersey, Atlantic City Airport New Jersey, Bayfield New Jersey, Camden New Jersey, Cherry Hill New Jersey, Hoboken New Jersey, Jersey City New Jersey, Morristown Airport New Jersey, Mount Laurel New Jersey, Newark-Teterboro New Jersey, Paulsboro New Jersey, Perth Amboy New Jersey, Trenton/Mercer County Airport New Mexico, Albuquerque New Mexico, Columbus New Mexico, Santa Teresa New York, Albany New York, Alexandria Bay New York, Alexandria Bay-Thousand Island Bridge New York, Binghamton Regional Airport New York, Buffalo New York, Buffalo (Peace Bridge) New York, Buffalo Niagara International Airport New York, Cape Vincent New York, Champlain-Rouses Point New York, Chateaugay New York, Clayton New York, Fort Covington New York, Jamaica New York, John F Kennedy Airport New York, La Guardia New York, Lewiston New York, Massena New York, Mcguire Afb New York, Moores New York, Morristown New York, New York New York, New York Seaport New York, Niagara Falls New York, Ogdensburg New York, Oswego New York, Rochester New York, Rochester International Airport New York, Rouses Point New York, Sodus Point New York, Syracuse New York, Syracuse International Airport New York, Trout River New York, Utica New York, Watertown New York, Youngstown North Carolina, Beaufort-Morehead City North Carolina, Charlotte North Carolina, Durham North Carolina, Morehead City North Carolina, Raleigh/Durham North Carolina, Wilmington North Carolina, Winston-Salem North Dakota, Ambrose North Dakota, Antler North Dakota, Carbury North Dakota, Dunseith North Dakota, Fargo North Dakota, Fortuna North Dakota, Grand Forks North Dakota, Hannah North Dakota, Hansboro North Dakota, Maida North Dakota, Minot North Dakota, Neche North Dakota, Noonan North Dakota, Northgate-Flaxton North Dakota, Pembina North Dakota, Portal North Dakota, Sarles North Dakota, Sherwood North Dakota, St. John North Dakota, Walhalla North Dakota, Westhope North Dakota, Williston Northern Mariana Islands, Rota Northern Mariana Islands, Saipan Northern Mariana Islands, Saipan Int’l Airport Northern Mariana Islands, Tinian Ohio, Akron Ohio, Ashtabula/Conneaut Ohio, Cincinnati Ohio, Cleveland Ohio, Columbus Ohio, Dayton Ohio, Lorain Ohio, Put-In-Bay Ohio, Sandusky Ohio, Sandusky Bay Bp Ohio, Toledo/Sandusky Oklahoma, Oklahoma City Oklahoma, Tulsa Oregon, Astoria Oregon, Coos Bay Oregon, Newport Oregon, Portland Oregon, Rogue Valley/Medford Airport Pennsylvania, Allentown-Bethlehem Pennsylvania, Chester Pennsylvania, Erie Pennsylvania, Harrisburg Pennsylvania, Philadelphia Pennsylvania, Philadelphia International Air Pennsylvania, Pittsburgh Pennsylvania, Wilkes-Barre/Scranton Puerto Rico, Aguadilla Puerto Rico, Ensenada Puerto Rico, Fajardo Puerto Rico, Guanica Puerto Rico, Guayanilla Puerto Rico, Humacao Puerto Rico, Jobos Puerto Rico, Luis Munoz International Airport Puerto Rico, Mayaguez Puerto Rico, Ponce Puerto Rico, Rafael Hernandez Airport Puerto Rico, San Juan Puerto Rico, San Juan International Airport Rhode Island, Mellville Rhode Island, Newport Rhode Island, Providence South Carolina, Charleston South Carolina, Columbia South Carolina, Georgetown South Carolina, Greenville-Spartanburg South Carolina, Greer South Carolina, Myrtle Beach International Airport South Dakota, Sioux Falls Tennessee, Arkansas Aeroplex Tennessee, Chattanooga Tennessee, Knoxville Tennessee, Memphis Tennessee, Nashville Tennessee, Port of Chattanooga Tennessee, Tri City User Fee Airport Texas, Addison Airport Texas, Adistad Dam Texas, Amarillo Texas, Austin Texas, Austin-Bergstrom International Airport Texas, Beaumont Texas, Brownsville Texas, Corpus Christi Texas, Dallas Texas, Dallas Love Field (DAL) Texas, Dallas/Ft Worth Airport (DFW) Texas, Del Rio Texas, Eagle Pass Texas, Edinburg International Use Fee Airport Texas, El Paso Texas, El Paso International Airport Texas, El Paso-Bridge of the Americas Texas, El Paso-Paso Del Norte Bridge Texas, Fabens Texas, Falcon Heights Texas, Fort Hancock Texas, Fort Worth Alliance Airport Texas, Freeport Texas, Galveston Texas, Harlingen Texas, Harlingen - Valley Intl Airport Texas, Hidalgo Texas, Houston Texas, Houston - George Bush Intercontinental Airport Texas, Juarez-Lincoln Bridge Texas, Laredo Texas, Los Ebanos Texas, Los Indios Texas, Lubbock Texas, Mcallen Texas, Midland International Airport Texas, Nogales International Airport Texas, Orange Texas, Port Lavaca Texas, Pharr Texas, Port Arthur Texas, Port Isabel Texas, Port Lavaca-Pt Comfort Texas, Presidio Texas, Progreso Texas, Rio Grande City Texas, Roma Texas, Sabine Texas, San Antonio Texas, San Antonio International Airport Texas, Texas City Texas, Ysleta Utah, Salt Lake City Vermont, Alburg Vermont, Alburg Springs Vermont, Beebe Plain Vermont, Beecher Falls Vermont, Burlington Vermont, Canaan Vermont, Derby Line Vermont, East Richford Vermont, Highgate Springs Vermont, Morses Line Vermont, Newport Vermont, North Troy Vermont, Norton Vermont, Richford Vermont, St. Albans Vermont, West Berkshire Virgin Islands, Charlotte Amalie Virgin Islands, Christiansted Virgin Islands, Coral Bay Virgin Islands, Cruz Bay Virgin Islands, Frederiksted Virgin Islands, St Croix Virgin Islands, St John Virgin Islands, St. Thomas Virginia, Alexandria Virginia, Dublin - New River Valley Airport Virginia, Front Royal Virginia, Hopewell Virginia, Newport Virginia, Norfolk Virginia, Richmond Washington, Aberdeen Washington, Anacortes Washington, Bellingham Washington, Blaine Washington, Boundary Washington, Danville Washington, Everett Washington, Ferry Washington, Friday Harbor Washington, Frontier Washington, Kalama Washington, Kenmore Air Harbor Washington, Laurier Washington, Longview Washington, Lynden Washington, Metaline Falls Washington, Moses Lake - Grant County Airport Washington, Neah Bay Washington, Nighthawk Washington, Olympia Washington, Oroville Washington, Pacific Highway Washington, Point Roberts Washington, Port Angeles Washington, Port Townsend Washington, Portland International Airport Washington, Seattle Washington, Seattle-Tacoma International Airport Washington, South Bend-Raymond Washington, Spokane Washington, Spokane International Airport Washington, Sumas Washington, Tacoma Washington, Vancouver Washington, Yakima West Virginia, Charleston Wisconsin, Ashland Wisconsin, Casper Wisconsin, Green Bay Wisconsin, Manitowoc Wisconsin, Marinette Wisconsin, Milwaukee Wisconsin, Racine Wisconsin, Sheboygan Wyoming, Casper Other Select the port of entry where you physically entered the United States. If you did not enter the country through an official port of entry, select “Other” and type the name of the area you entered. Describe the general region you entered. Type the city and state if possible. Now, select your current immigration status. For most people, their current immigration status will be the same. However, other people have changed status since entering the United States. SEVIS ID numbers start with the letter N and are generally followed by 10 digits. You can find your SEVIS number on various documents like Form I-20 and DS-2019. On the sample Form I-20 below, the SEVIS number is on the top left-hand side of page above the student’s surname. On the sample DS-2019 below, the SEVIS number is on the top right-hand side of the page in the box above the barcode. Provide your current mailing address and contact information. Enter a safe address where USCIS may contact you by mail. You may list a valid residence, APO, or commercial address. This may be a Post Office address (P.O. Box) if that is how you receive your mail. Is the above mailing address also your current physical address? Your physical address is the residence where you live. Enter the address where you live inside the United States. This contact information is so that USCIS can reach you. Your mobile phone number and/or email address will also be used so that CitizenPath can create a complimentary Form G-1145 for you. By filing G-1145 with your adjustment of status application, USCIS will text and/or email when they have accepted the application for processing. You're almost finished. This is the final page. Have you previously filed Form I-765? If you have ever applied for employment authorization, you should indicate “Yes." Because you are applying for employment authorization card on the basis of a 24-Month Extension for STEM Students (c)(3)(C), the application requires some additional details about your employment situation. Because you are applying for employment authorization card on the basis of an H-4 Spouse of an H1-B Spouse (c)(26), the application requires you to enter the receipt number of your H-1B spouse's most recent Form I-797 Notice for Form I-129, Petition for a Nonimmigrant Worker. A receipt number is a unique 13-character identifier that consists of three letters and 10 numbers. Omit dashes ("-") when entering a receipt number. However, you can include all other characters, including asterisks ("*"), if they are listed on your notice as part of the receipt number. USCIS wants to determine whether you have an economic need in order to warrant the issuance of a work permit, also known as an Employment Authorization Document (EAD). People work for many reasons so there are many valid answers. It isn’t necessary to prove that you are going into poverty – you only need to demonstrate that you have a need. These are just some examples of valid answers. Use the space provided to describe your situation and economic need. Report your individual income (not your household income) truthfully. This is a total of all your expenses. If you live with your family, you can report your share of the household's total expenses (rent, food, auto, etc.) Your personal expenses (like education, transportation, phone, books, etc.) should be included. This is the total of value of money you might have in a bank account plus any other valuables that you might own. Include your car, home, stocks/bonds, land, jewelry, etc. Owning assets will not disqualify you from a work permit. Did you receive help from an interpreter to prepare this application? I can read and understand English, and have read and understand every question and instruction on this application and my answer to every question. The interpreter named above read to me every question and instruction on this application and my answer to every question in a language in which I am fluent. I understood all of this information as interpreted. If the applicant received help from another person to prepare this application, indicate here. I am the applicant, and I prepared this application. I am not an attorney or accredited representative but have prepared this application on behalf of the applicant and with the applicant's consent. I am an attorney or accredited representative of the applicant that prepared this application. Extends beyond the preparation of this application. Does not extend beyond the preparation of this application. Will you attach Form G-28 to the application?